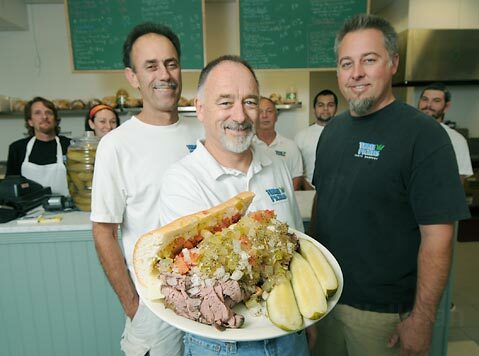 A Three Pickles roast beef "sub our way," presented by owners (from left) Bob McCourt, Bob Lovejoy, and Clayton Lovejoy at their new Goleta location. Those products include a pastrami sandwich, the Presidio, which can even make this East Coast snob weep with deli-cious joy. “It was important to get pastrami with a little bit of marbling to it,” explained Clayton Lovejoy, Bob’s son and co-owner. “I probably tasted about a hundred pastramis before I found the one I liked. Then we slow-steam, rendering off a lot of the fat. Then you just barely melt the cheese over that. The secret, though, is our rye bread, for me.” That bread, baked daily by a little Italian bakery in the San Fernando Valley (they refused to provide any more details), is driven to Ventura, and Clayton, who lives there, drives it the rest of the way into town. Delight in deli at Three Pickles’ two locations: 128 East Canon Perdido Street and 420 South Fairview Avenue. Call 965-1015 or visit threepickles.com. The Goleta location, which will celebrate its Grand Opening on Friday, November 6, is now also open for breakfast.